Blondie and Brownie: Breakfast Decadence at Shopsins: French Toast Grilled Cheese and Donuts! Breakfast Decadence at Shopsins: French Toast Grilled Cheese and Donuts! 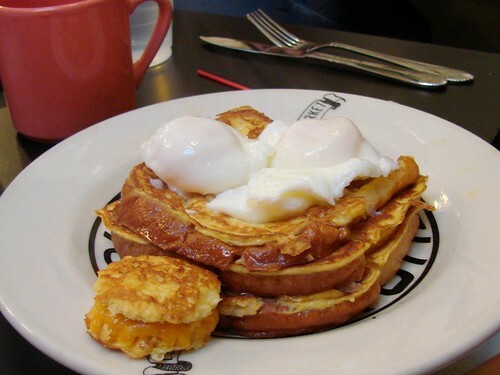 Only Shopsin's could come up with something as diabolically delicious as a grilled cheese made up of french toast and poached eggs. Brilliant. I was excited to see that Shopsin's famous donuts have made their way back on the most recent iteration of the menu. 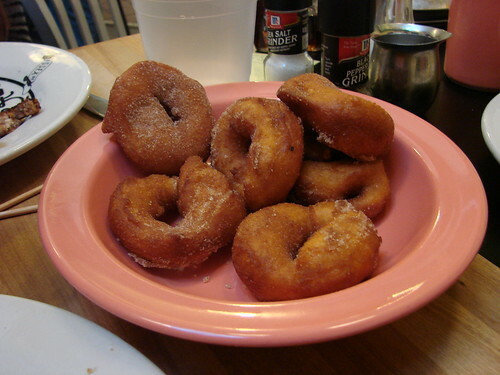 In addition to our entrees we opted to share a half order of cinnamon donuts with Blondie's friend Ginger. There's nothing in the world like a hot, fresh donut and these are made to order. They go from fryer to your plate (to your table) in around a minute, arriving perfectly crispy on the outside and soft and tender in the middle. Highly, highly recommended that you save or make room for these. you took pictures are survived to tell the tale? I took photos with my point-and-shoot last time I was at Shopsin's and it wasn't an issue. Can't wait to try those doughnuts! I've got a Shopsin's date w/ a friend at the end of this week, and it's been far too long since I've had a good one. @Steven: I've been eating at Shopsin's a lot longer than I've been blogging, so I actually do feel a little awkward about snapping some pictures. Still, some meals are too damn delicious not to be documented. I don't make a big disruptive deal of taking my shot and it hasn't been a problem. If Kenny or Zach ever asked me to put away my camera, I'd do it in a heartbeat. They've seen me take pictures before. Zach asked me to not take pictures of them or the furnishing to which I retorted "I don't want a picture of you. I want a picture of the food." And it was all good.